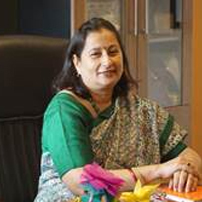 With almost 3 decades of rich experience behind her, she has earlier held the reigns of Ryan International School, Vasant Kunj New Delhi and Scottish High International School, Gurugram as the Principal. She believes that every child is unique and born with inherent talent which needs to be groomed and polished. She envisions that every child excels in a sport and art (performing as well as fine) activity along with academic excellence. Mrs. Malhotra has initiated the Special Education Needs (SEN) Department in the schools that she has led. The Inclusive Education Programme aims to integrate students with learning disabilities in mainstream education and addressing their needs so as to bring out the best in them. Her passion for education and innovative teaching, meritorious work in the field of Social Welfare, Indian Culture, Music, Dance and Art has been rightly recognized and she has been felicitated with the ‘Progressive Principal of India for the year 2017’, ‘Vidyashree Award’, ‘Avantika Dr. Radhakrishna Samman’, ‘Best Educationist Award’, ‘The Best State Principal –Haryana Zone’, ‘Best Mentor’ award by Global SOTY Foundation and many more. Under her leadership, MRIS-46 has been awarded accreditation by the US based AdvancEd Commission for five years based on the S chool’s exemplary performance in all areas. She joined the Manav Rachna Group in June 2009 at MRIS-46 where she began her journey of turning the MRIS vision and mission into a reality. School has grown from a strength of 125 children to almost 2800 children in a span of just 9 years.